On 25 April 2015, an earthquake measuring 7.8 on the Richter scale hit Nepal. The epicenter was near Barpak, Gorkha. In its aftermath, this natural disaster left over 8,000 dead, 19,000 injured, and more than 450,000 displaced. The United Nations Office for the Coordination of Humanitarian Affairs (UNOCHA) has worked relentlessly since the earthquake hit to provide relief and aid to the affected areas. 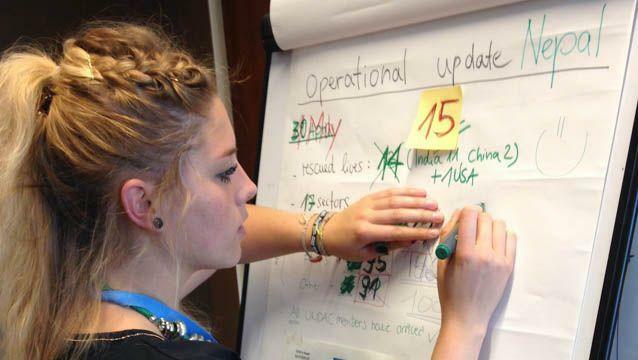 In order to understand the work that UNOCHA is doing we talked to Lena Siedentopp, focal point for OCHA’s Virtual On-site Operations Coordination Centre around the Nepal earthquake. Ms. Siedentopp is a student of the Geography of Environmental Risks and Human Security Master’s degree program at the United Nations University in Bonn. She is currently doing an internship with UNOCHA in Geneva, her primary focus being a disaster preparedness project in the Middle East. In the wake of the disaster in Nepal, she was appointed focal point for OCHA’s Virtual On-site Operations Coordination Centre (VO) and managed the VO throughout the duration of the response. Here, Ms. Siedentopp talks about the immediate responses to the Nepal Quake and how her Masters’ programme has helped prepare her for this work. When did you first hear about the Earthquake in Nepal? On Saturday, 25 April, a 7.8 magnitude earthquake struck central Nepal at 11:56 local time (7:11 UTC+1). Immediately after the earthquake I received a Red Alert notification from the web-based Global Disaster Alert and Coordination System of a sudden onset disaster in Nepal. OCHA’s Emergency Services Branch Field Coordination Support Section (FCSS) was mobilized by the Section Chief to ensure suitable capacity was available at Head Quarter to support first response efforts. Key FCSS staff was called into the OCHA Office and was allocated key response functions. My colleague Ms. Iben Gejl Valbak and I were appointed as Focal Points for the Virtual On-site Operations Coordination Centre (VOSOCC). What are your main functions as focal point for the VOSOCC? As the focal point for the VOSOCC, I have to moderate and monitor the platform for consistent cooperation, real-time coordination and accurate information management among international humanitarian actors. I also have to ensure that international responders (on and off-site) and the Government of Nepal are linked. Additionally, I coordinate the mobilization and demobilization of relief teams, publish Situation Reports, provide real-time updates on the operational environment and respond to questions and concerns posted by international first responders. What was the first task you had to do at UN OCHA with regards to the Earthquake? As the earthquake hit, there were a variety of tasks that had to be done quickly and simultaneously such as gather and continually update key facts and figures (e.g. number of fatalities, injured people and reports on damage to infrastructure, etc.). It was important to keep confirming the validity of information. We also had to gather information on practical issues: For example, inform relief teams on logistics at the airport; and highlighting information pertaining to access in remote areas to support relief teams preparing for arrival onsite. Other information we gathered was on national response capacity so that relief teams could calculate in-country needs prior to arrival. This was especially important because many USAR teams and FMTs mobilized, deployed and monitored based on information and advice provided on the VOSOCC. We also mediated between relief teams, published operational meeting schedules, advice from the government and the On Site Operations and Coordination Centre. Given the volume of information being published on the VOSOCC early in the response, we had to provide coverage 24/7 to ensure there were no information gaps. Why are the first tasks so important? As a real-time response coordination tool, OCHA needs first responders to use the VOSOCC as a primary source of information. In the first few hours’, immediately after the earthquake, no international teams had arrived in the field to provide accurate information. Therefore, it was imperative that the VOSOCC was constantly maintained and kept up to date. One of the main challenges, we faced, was gathering information gathering for remote areas (damage, fatalities, needs, access). What are the major problems onsite in Nepal? Some of the major problems onsite were a large number of fatalities and injured, large scale damage, urgent needs, limited access to drinking water and food. Additionally the limited capacity of Kathmandu’s international airport, logistical limitations (number of apron slots for arriving aircraft, storage capacity for arriving assistance, the prioritization of landing permits, no internet connection, limited cash availability and landing restrictions for heavy aircrafts added to the chaos as massive assistance (relief teams and goods) arrived and international people tried to leave Nepal. Has social media affected your work in setting up the coordination platform? How? No. Social media did not affect the establishment of the coordination platform. However, the impressions of my colleagues in the field were published constantly on social media websites (e.g. UNDAC and INSARAG Facebook pages). How has your Master’s program prepared you for this work? The Master program provided me with a solid understanding of the core links between natural disasters (i.e. an earthquake) and the risks to/impact on society (vulnerability, resilience). This knowledge was important to strengthen my understanding of the capacities and requirements on the ground. The third semester of my Master Program at United Nations University has especially prepared me for this work. The semester was practically oriented towards first responders training and emergency coordination set-up exercises. This training equipped me with first hand insights from experts and provided me with skills for this sudden onset emergency response. How is the internship experience at OCHA ESB in Geneva contributing to your future career planning? Whereas in my previous internships I was exposed to a conflict emergencies, in ESB I have the opportunity to gain exposure to the response to both slow-onset and sudden-onset disasters. This has broadened my understanding of the scope of the emergency response field and equipped me with a better understanding of the full range of functions which I can pursue in my future career. I am looking forward to continue to work in this sector at national and international levels.